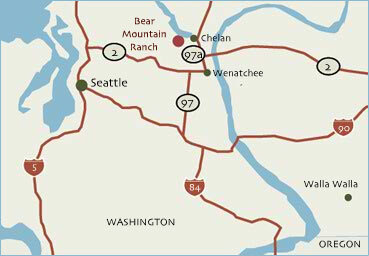 Less than three short hours from Seattle and Spokane, Bear Mountain Ranch is located in North Central Washington next to Lake Chelan, just off Highway 97A, the main route into Chelan. From the Puget Sound area, take either the Stevens Pass Highway (Hwy 2) to Wenatchee or take Snoqualimie Pass Highway (I-90) to Cle Elum and then the Blewett Pass Highway (Hwy 97) to Wenatchee. From Wenatchee, take the Highway 97-A cutoff to Chelan. We're 30 miles north of Wenatchee. Slow down when you see the lake...we're on the left. We look forward to seeing you on the ranch real soon.